ABC News. Thu, 25 Apr 2019 22:10:14 -0400. ESPN. Thu, 25 Apr 2019 20:24:39 EST. Manny Fernandez. New York Times. Fri, 26 Apr 2019 00:13:42 GMT. Commissioners with the Texas Commission on Environmental Quality want more data on how a medical waste facility would affect an El Paso neighborhood. Aaron Montes, El Paso Times. El Paso Times. Thu, 25 Apr 2019 20:10:34 -0400. ABC News. Thu, 25 Apr 2019 19:30:29 -0400. John Bowden. The Hill. Thu, 25 Apr 2019 22:49:35 +0000. Joshua Mann. American City Business Journals. Thu, 25 Apr 2019 22:05:12 +0000. A suspected thief is in custody after leading Mesquite police on a chase through Dallas County Thursday morning. Photo Credit: NBC 5 News. NBC. Thu, 25 Apr 2019 16:19:09 -0500. As Texas' economy has boomed, investors have begun to seek more affordable opportunities outside Dallas, Austin and Houston. Investors in San Antonio should take note: The Alamo City is squarely in LA investors' sights. Ryan Salchert. American City Business Journals. Thu, 25 Apr 2019 21:00:00 +0000. Yahoo. Thu, 25 Apr 2019 16:06:35 -0400.
Business Wire. Thu, 25 Apr 2019 18:51:00 UTC. Sarah Mervosh. New York Times. Thu, 25 Apr 2019 17:29:23 GMT. Bumble, the female friendly dating app based in Texas, is rolling out the feature in June which will be will be capable of detecting lewd images with 98 per cent accuracy. Daily Mail. Thu, 25 Apr 2019 17:58:40 +0100. Houston-based KBR will soon be reclassified as an IT consulting company by stock traders. Sergio Chapa, Houston Chronicle. Houston Chronicle. Thu, 25 Apr 2019 15:10:11 UTC. CNBC. Thu, 25 Apr 2019 15:06 GMT. Natural Gas Intel. Thu, 25 Apr 2019 09:40:13 -0400. Phil Miller. Star Tribune - Minneapolis, Minnesota. Thu, 25 Apr 2019 13:15:47 +0000. San Antonio Express News. Thu, 25 Apr 2019 10:20:26 UTC. According to the 2010 census, the population of Texas was 25,145,561. In 2008, the estimated population of Texas was 24,326,974, whereas in 2006, the population of Texas was about 23,367,534. For detailed, up-to-date information about Texas' demographics, visit the U.S. Census Bureau's QuickFacts about Texas web page. For maps of Texas, visit this Texas Map website. 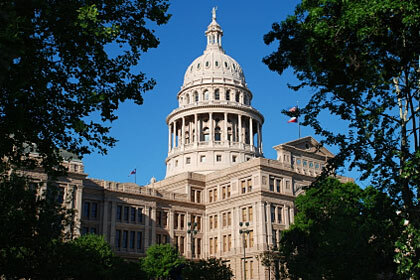 The photograph above shows the state capitol building in Austin, Texas. Texas newspaper publishers are listed here, along with their addresses, phone numbers, and website links; Texas library names, descriptions, and website links are listed on this page. More information about Texas can be found here.